Cover your house with exciting, colorful lights! Everyone loves the look and effect of festive outdoor house lighting, but no one wants to spend the time and effort needed to string them up. They tangle and kink, and when you finally get them positioned correctly and turn them on, either they don’t work or several bulbs are burned out. Insta Lights™ changes all that for the better—you’ll never string complicated lights again! Instead, you’ll shower your house with festive Red, Green and Blue lights from an LED dome light that simply stakes into the ground. Just aim it at your house and plug it in—it’s that simple. 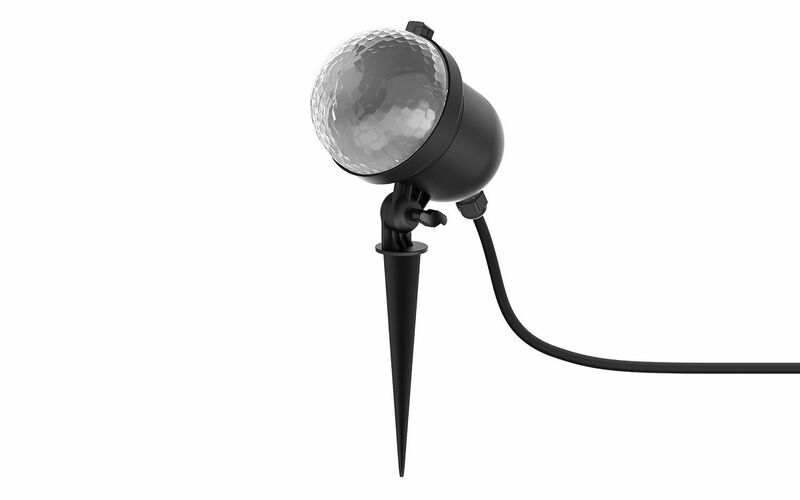 Because it’s weatherproof, you can leave Insta Lights outside in rain or snow. Plus, it comes with a remote control that selects color and light sequence and there’s also a built-in timer to shut it off automatically. Insta Lights make getting beautiful house lighting easy and fun. Never string complicated lights again! Included remote selects colors, light sequence and more!